Why does one want to create a mobile app? Let’s be honest, besides a great desire to give the world outstanding service and provide users with the best experience that every developer dreams about, and to gain extra-high revenues. Why does one want to create a mobile app? Let’s be honest, besides a great desire to give the world an outstanding service and provide users with the best ever experience, every developer dreams about gaining extra-high revenues. Being impressed by empyreal earnings of breaking startups thousands of entrepreneurs enter the business desiring to emulate the success of WhatsApp or Instagram. Yet, the app business is not that simple. Just imagine, there are more than 1.5 million applications currently available in AppStore and GooglePlay. According to the latest estimations, the total number of mobile app developers reaches 8,7 million. That makes business pretty tough in terms of market competition and monetization. According to the recent InMobi survey, the picture is much more deplorable due to the fact 55% of developers make less than $1000 per month and only 20% of them reach 1000 app downloads. That is why startupers shouldn’t only be concerned with app construction, but also with facing the many sophisticated issues connected to monetization. Now, is there any way to make an app extremely profitable? We would like to share our experience with it along. 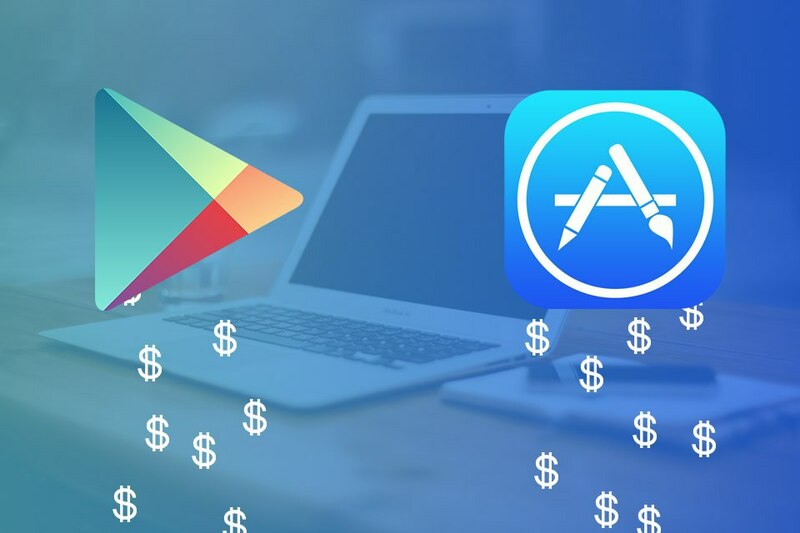 There are two most common ways to profit out of mobile app development: either to earn on paid downloads and in-app purchase or monetize apps via advertising. In case you choose a free opportunity, it means that app is chargeless for users to download. This strategy eliminates possibility of making money via direct sells, so developer should be inventive to get the revenue another way. Free of charge approach is considered as the most popular across the whole industry. According to Statista Inc., in 2015 63% of app developers preferred advertising as a monetization model comparing to 20% of those who have chosen paid apps. Let’s explore the reasons for such a high popularity and check the possible risks. 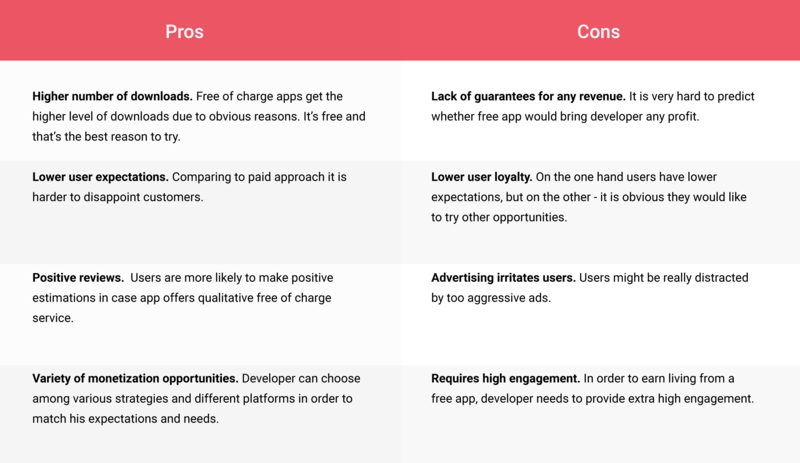 Comparing to free applications paid ones are clear and simple in terms of monetization. Users pay for the ability to download and utilize the app or its particular features. Such a strategy has a vast number of benefits as well as it assumes various business risks. Let’s check how paid approach might contribute your business. What is the essence of your app? What is its ultimate goal? What apps or paid app features are your users usually willing to pay for? What are the features in your app that users would be willing to pay for? What monetization models do your competitors use and how well have they worked? And of course, there much more issues to think about. Each app developer should find a delicate balance between the users’ needs and the ability to get relevant revenue on the application. 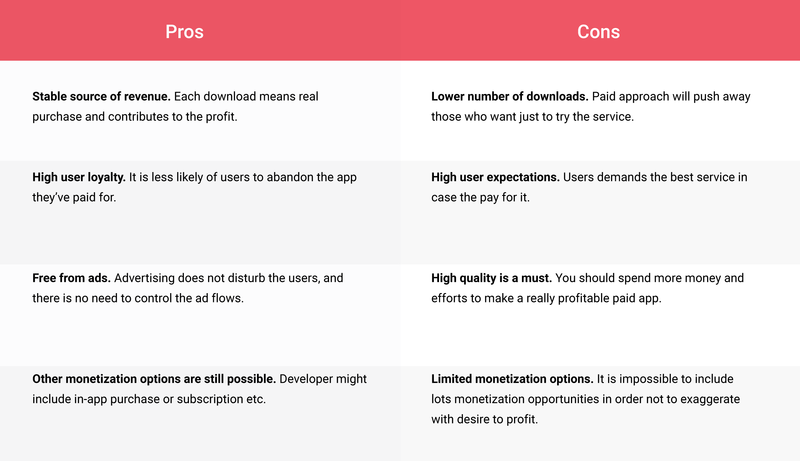 Either way, monetization strategies should be chosen and built into your app before launch in the app store. It can be iterated or completely modified during the project lifecycle in case your goals and means change, but it is very important to be ready with an excellent business plan from the very beginning. How to choose mobile monetization platform that fits your app? You have weighed all the pros and cons, designed a business strategy and came to a conclusion that monetization via advertising is the most reasonable option. So, how to choose the right platform without turning the process into a complete nightmare? Today, more and more advertising networks are rising, providing the high demand of software startups with variety of monetization models available. There is no single dominant in the field. So what is a must to take into consideration? It is important to check out the company’s size and its valuations, read the testimonials and investigate the track record. Such information might provide you with additional facts and can be a fertile ground for decision making. Check out whether the monetization platform you’ve chosen has trustful partners and recognizable users. It is obvious that in case the platform has valuable clients it will add trust to it. IDAP team has deep knowledge in app development and monetizing. 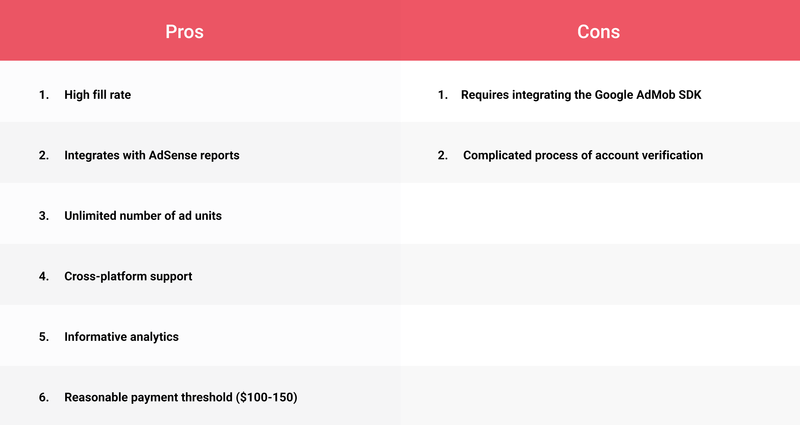 We’ve crossed a rocky-road on choosing the right monetization model for our precious and beloved apps. And now we are happy to share our experience about the monetization platforms we have chosen as basis for promoting our applications like Flappy Smasher, Easy Meme, etc. Check out the short review and thorough comparison based on our experience. We hope it will be useful for you. Chartboost is one of the biggest and oldest among monetization platforms. In was founded in 2011 by Maria Alegre and Sean Fannan in San-Francisco, US. Chartboost focuses on direct advertising between app developers and provides users with interstitial and video ad formats. Opinion: Chartboost is an old and trusted platform for monetizing, so you should definitely take this opportunity into consideration, especially in case you are going to promote a game for mobile phone. Nevertheless, due Chartboost’s main focus is mobile games, promotion of other types of apps brings less engagement. AdMob is an advertising network founded by Omar Hamoui and obtained by tech giant Google in 2009. Admob is one of the largest and most popular monetization platforms, serving more than 40 billion ad items per month. It allows developers to promote or monetize the app via in-app ads. Opinion: Admob is a great opportunity to promote various types of apps. It supports diverse operational systems and has no strict focus regarding the type of the application.